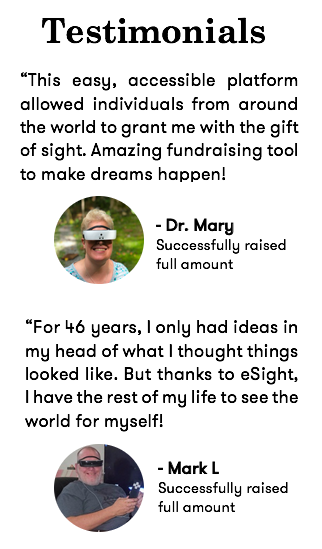 Every dollar raised on our platform will go directly towards the purchase of eSight for a deserving individual who belongs to the low-vision community. eSight is proud to cover all website fees associated with using this platform. Thousands of magical eSight moments have been caught on camera to date. By clicking here, you will witness countless lives being changed in a matter of minutes. There are 441 million visually impaired people in our world today, but with eSight's breakthrough electronic glasses they can engage in virtually all Activities of Daily Living. Together, we can change the lives of countless individuals living with visual impairments, including legal blindness. Take the time to donate today and you will be able to confidently say you have participated in a movement that involves changing lives of those around you. Please see below to find a campaign you would like to contribute to, and empower another deserving individual to join the eSight community.